fairy tail When Do You Think Natsu Will Make Lucy His Girlfriend? have any ideas? pls. reply. This will most likely happen at the end of Fairy Tail. He will start to realise he has feelings for Lucy during the last arc. Then they will get together during the last few chapters/episodes. HAPPY ENDING(Atleast for NaLu fans). Obviously at the end or sometime near the end. Oh, they might even have an arc to them selves! Not likely though. And let's face it, it's hard for it NOT to happen because Mashima didn't make her meet Natsu by 'coincedence' for nothing, right? No offense to Natsu fans, but he's a bit dense. So, I'd be surprised (and EXTREMELY happy) if he even asks her out. No idea, but I bet it will happen before fairy tail ends. relationships are things that might not really happen for natsu, while i maintain he would never end up with lucy and that if he ended up with anyone its lisanna. but even that might not happen to the end, and if lucy ends up with anyone looks like it might be loke and that is slim. ^ He might if he figures out that Lucy likes him. 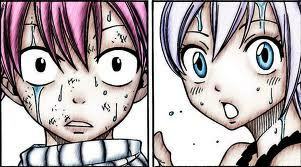 I really don't see this happening, i have considered whether its because i'm a natsu x lisanna person but thats not it, its just they haven't been any real signs either canon or filler that there is any of this kinds of feelings from natsu towards lucy. The only thing we see are just weak things like they always being together which can be explained with the main characters arguement, them wearing similar clothes this sometimes is as a result of cloth change from the celestial world, or becos they are in the same team. The things Natsu does for lucy the consoling and saving and tuff is the same he'd do for levy, for cana, laki, juvia, kinana, and basically any female member except for erza and mirajane. He has shown that he dreams of the time he spent with lisanna, whats to say he doesn't dream it frequently oe at least more than the once we know, plus thats couple dancing, he did with lisanna. but it is not that the chances of this happening i 0%, its just there isn't' any evidence so far, and there is the usual main characters love that happens, but if this relation does happen then it'd be sad. BUT I HOPE THEY WILL (NALU) END UP TOGETHER!